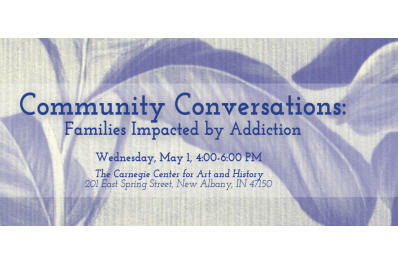 Join Volunteers for America for a Community Conversation to discuss the impact of addiction on children and families in an intimate setting at the Carnegie Center for Art and History. The Clark and Floyd counties community is invited to this panel discussion, featuring Freedom House, a residential addiction recovery program for pregnant and parenting women. Hear from a Freedom House program graduate and an expert in addiction recovery, and ask questions. Food and beverages will be provided. The Carnegie also welcomes you to get inspired by the NAFC Secondary Schools Art Show that will be on view.